There has been a lack of games with impeccable quality for Windows 8. Certainly there are a few gems, but for the most part gaming hasn't been a huge draw for users of Microsoft's latest OS. In fact, since acquiring my own Windows RT tablet, I have only installed three games through the Windows Store. Solitaire had been dominating what time I did spend gaming on the device. Then I caught wind of a little title by Greenheart Games, Game Dev Tycoon. Game Dev Tycoon is a brilliant title and incredible first offering from the two man studio. Putting players in the shoes of a one-man development studio, Game Dev Tycoon tasks﻿ them with surviving the volatile gaming market for 35 years. Players start in the 80s and their garage. The storied history of gaming is faithfully recreated as classic consoles are released and partnerships fall apart. Those familiar with the rise and fall of consoles will definitely have a leg up. For instance, rather than investing too heavily into developing titles for the short lived Commodore 64 or Dreamcast, I knew I could keep developing titles for the incredibly stable PC platform and survive. Since the game spans 35 years, there's plenty of time for players to grow into a full fledged studio with multiple team members responsible for everything from design to technical aspects. It will be a decade or two before players reach that point, so to help pay the bills, there are optional contracts that can be completed for valuable Research Points and cash. But be careful because if the team can't complete the contract in time, the studio will be hit with a steep fine. As games are developed and contracts completed, players are awarded with Research Points. These points are then invested into learning new genres, technologies, and various skills. This opens up more options to players when creating custom game engines and subsequent games. There's a pleasant amount of depth to be found without it becoming overwhelming. Even tasks like training employees and increasing their speed, design and technical skills are very important to the overall health of the studio. Everything matters and that is fantastic as I never once felt like I was doing a task that was ultimately pointless. Everything helped my studio in one form or another. 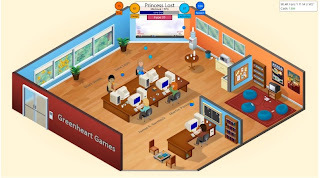 While Game Dev Tycoon does a tremendous job of simulating a studio, at the core players are there to develop games. When creating a game, players must assign a title, platform, genre, game type, and engine. It's an easy trap to fall into of duplicating one's favorite titles. I'm just as guilty of shamelessly recreating Final Fantasy or World of Warcraft and grinning like a madman as the sales went through the roof. But there's genuine fun to be had when coming up with a title all of your own and seeing it succeed. On the flip side, it can be frustrating watching a game you thought would be a hit get slammed in the reviews. As a game reviewer myself, I was infuriated and disgusted simultaneously. It definitely made me take a step back and evaluate my own reviews. I can't think of another game that has made me ponder such a large part of my life before. 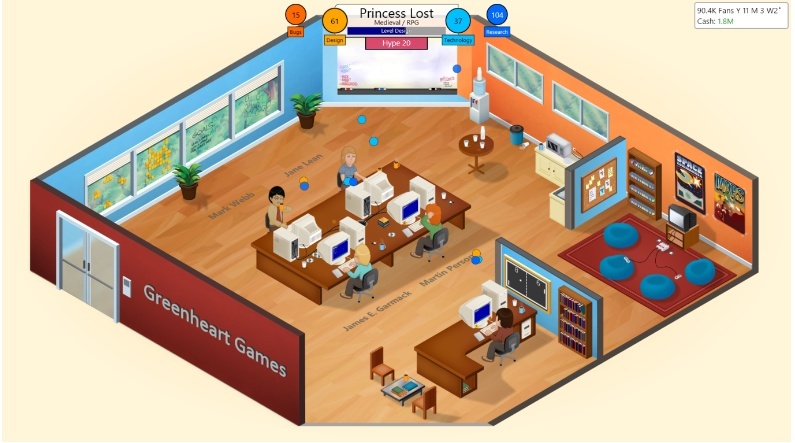 Game Dev Tycoon sticks to a simple cartoonish style which serves it well. Characters are stationary for the majority of the game, either hammering away at their keyboards or scratching their heads at a puzzling task before them. The multiple studios are full of bright cheery colors which lend it a lighthearted feel. Checking out the whiteboards and various knickknacks reveal loads of small details and nods to other developers. Since Game Dev Tycoon spans three and a half decades, there's a decent amount of time that can be invested before reaching the end. Hitting the end takes several hours and players can opt to continue playing afterwards and fully master their studio. Of course, once someone has reached the summit, it's always fun to start at the bottom once more and see how else it can be conquered. While there is a lot to enjoy in Game Dev Tycoon, there are a few odd bugs that I experienced while playing on my Windows RT tablet. The biggest was that even after purchasing the full version, the "trial" tab was locked in the top left corner of the screen. And at one time, some letters in my studio's name were switched around in one of the pop-ups. Neither were game breaking or interfered with playing the game itself and I'm sure a patch will take care of the issues in the future. Game Dev Tycoon offers a free demo in the Windows Store. Players can play up to year five before they must unlock the full game. But at a mere $7.99, it's definitely worth every penny. I found myself engrossed for hours and couldn't put it down until I finally beat it. Game Dev Tycoon is a great addition to any collection and presents some fun insight into the world of game development. I tip my hat to the team at Greenheart Games. Hopefully we'll see more great things from them in the future.